So I ditched the tent; and instead, I decided to start carrying a Simple Tarp. Why a Tarp is a Better Shelter Choice. When hiking and camping out in the backcountry, tarp tents allow you to feel even closer to nature. There’s nothing quite like sleeping under a tarp out in the middle of the wilderness; that is why we go out there, right? 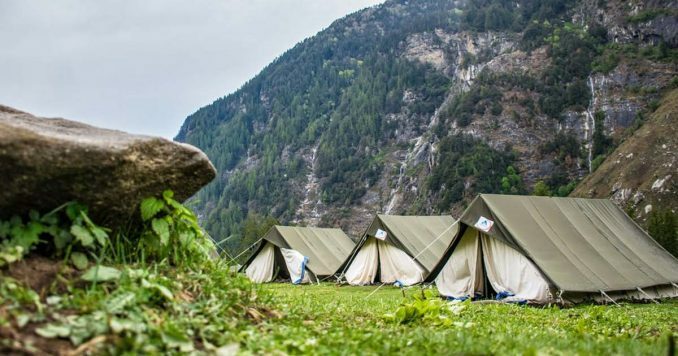 In most cases, a tarp is going to be lighter than any tent on the market. Switching to the tarp allowed me to cut down on my pack weight. It’s a dual purpose system. Unlike a tent, I can get more than one use out of the tarp. Besides the obvious shelter related uses, I can use the tarp as a raincoat; as part of a rain catchment system; as an improvised first-aid sling or bandage wrap; to make repairs on my clothing, backpacks, and other gear that may become damaged; or a hundred other uses that a tent just wasn’t able to handle. But the main reasons I went with the tarp were because of how easily they could be set up and broken down, and how many different configurations I could get out of one. With little more than a bit of paracord and a tarp, you can quickly set up an improvised shelter that will keep you warm and dry. Usually, the only two things you need are the tarp and a bit of cordage. That being said, there are times where you may want to add a couple of accessories to your shelter system. Depending on the environment I plan to be in, I can maximize the effectiveness of my shelter by adding a bivy sack, a reflective emergency blanket, and a mosquito/bug net. Bivy Sacks: A bivouac sack (Bivy) was originally intended to serve as a waterproof cover for a sleeping bags, but over the years light hikers have adopted them as minimalist shelters and have even started using them as stand-alone sleeping bags. Reflective Blankets: Usually weighing less than an ounce, space blankets are almost always a good add-on item to consider. Not only are they great for reflecting your own body heat during an emergency, but they can be worked into your tarp shelter to help reflect heat the heat from a small fire into your shelter. Mosquito/Bug Net: If I’m traveling in an area with a lot of biting insects, especially mosquitos, then a good bug net is a must have. How do these tarps hold up against radiation…? Walk softly and carry a tarp, I always say…! Funny, I say the same thing. Granted the closest probable target for a nuke strike to my location is 160 miles or better away, even then doughtful a high risk target, and the prevailing winds almost never blow from that direction. Next probable target is easily 300 miles away. May not be a good prep for you’re location, but an effective light weight prep for others. I have used tarps before I started investing in tents. Years and a few tents later, I went back to just using a tarp. A tarp is definitely more versatile than just about any tent, plus you can use different configurations. I keep a tarp with my packs I use. With a tarp, you can make different type shelters with or without poles, collect water, whether it’s rain or dew. Use it as a poncho, ground cover and more. The tarp doesnt have to be large. 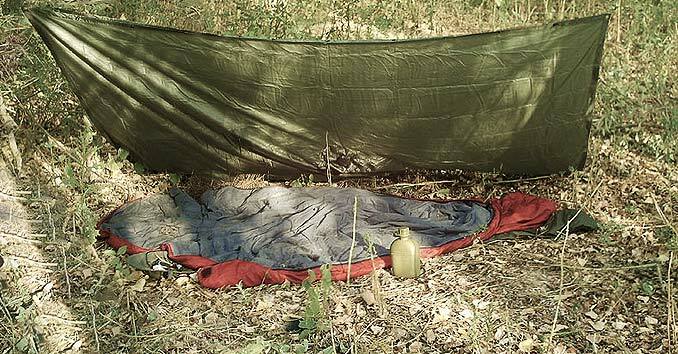 Even a small 6×8 tarp will be quite adequate for most purposes with 1 or 2 people. Always have a length of cordage Many people like Paracord. It’s strong, light and resistant to stretching when wet. The longer the cord you have, the more uses you will find. Always have at least 20 ft of cord. With tarps, I prefer the camo over blue. In a survival situation, it’s better to blend in than to stand out. For those who hammock camp, a tarp is a given. Even in winter, with a hammock. You are off the ground and more likely to stay dry. Once you use a tarp, you may just ditch the tent entirely. I’m not too experienced on trails, but what if u are in a more desert, bushy area w/o trees dor cords? Use hiking poles, even tent poles and lots of line. Tie off to bushes, Large rocks and a few stakes. Mostly, I sleep on the tarp and if it rains, I pull the tarp over myself and my gear. I hike Big Bend and haven’t carried a tent in decades. In the case of basin and range desert areas in Arizona, any low spot in the desert, such as washes and areas at the base of desert mountains, will have an abundance of mesquite, Palo Verde, acacia or other types of trees. I can’t imagine that you would set camp in a totally barren area, so seek those locations. These thickets will provide natural shade, as well as concealment. There is no reason to not have a good supply of paracord, although I would recommend a minimum of 50 feet. It is so useful that you can never have too much. One of the most under estimated items today. We always have several different sizes on hand for all sorts of emergencies. Even if you don’t need one to use as a tent, just try to find one after a storm moves through your area and does a lot of damage. One of the first things to sell out. Tarps are a great multiuse item. I like packing items that have multiple uses. It takes less space, weighs less and often ensures that you have multiple items that can to the same thing. It’s ability to protect you from a nuke is wuestionable, but it does a lot of things really well. Great thing about tarps, when folded flat you can put 2 or 3 in your trunk, taking up almost no room. I usually buy the camo version also. If you get stuck long term a tarp over a tent is great for camo, additional protection from the elements. Canvas tarps are heavy, but their durability and lack of noise when pitched add big points in my book. I’ve slept with the blue synthetic tarps flapping in the breeze overhead – its like sleeping in a potato chip factory, so noisy. We keep several tarps, but the 8×10 seems to be the best for sunny weather, 12×14 in wet (need the extra dry space. We keep paracord loops at all grommets and use bungies for securing to fixed objects. A handy-dandy tarp I must say. Tarps are always under-rated in survival kits. The bulk of them leaves them left out of some bug out bags, but they are worth the room in my opinion. A tarp is the most versatile shelter tool you can have. 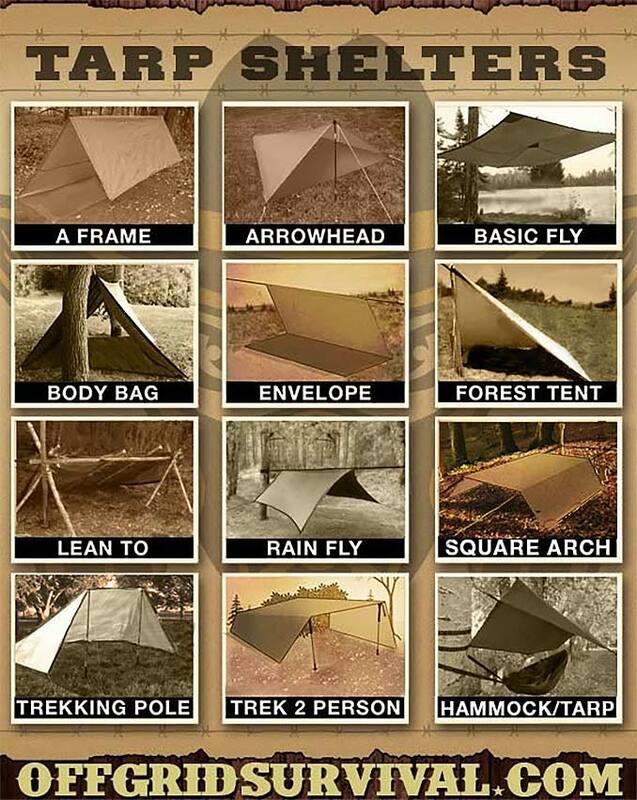 I agree that a tarp can be one of the most important things to have on an survival adventure. It can be useful for many different things, most importantly being the shelter. Nice! Its a step up from a space blanket and two steps up from using a poncho. You guys just wait till you find out about USGI rain ponchos and woobies. I cut and sewed a head hole for my woobie. Wanna go one step further? Sleep sitting upright with your back against something. Light a UCO candle and place it between your legs under the poncho. Then who needs a tarp? You kids and your baby blankets. Real men use poncho liners. Agreed, hard to beat poncho hootches and even better today are the Brit Bashas. Get one on ebay. They’re heavier and multi functional, even as a stretcher w/handles. A tarp is definitely a must-have. I always have two of different sizes in my pack. In my area, though, a tarp could never replace a tent between 01 May and 30 Sep. You wouldn’t get a lick of sleep trying to sleep under a tarp during the mosquito/blackfly/deerfly seasons. Even with a tent, though, the tarp will keep your woodpile dry or will keep the rain off the dining/food prep area, for example. Once, during a storm, when a tree limb fell on the fly of my tent, splitting it down the centre, I would have been in doodoo without a tarp. I’ve even erected a tarp vertically as a windbreak from a howling sleet/snow storm in late winter. Problem with tarps is ticks and chiggers have easy access to you. A tent is a much better option because it keeps those critters out. If you have ever been eaten alive with East Texas red bugs then you know a tarp is not an option. I always carry a tarp as well because I like having a bit of shade or somewhere to get in out of the rain. It really stinks when it rains all day. Cooking is more pleasant and you don’t feel cooped up like in a tent. I tried to convince some boys I had on a trip to put some bug repellant on or use their tent. They insisted on sleeping “under the stars”. Sunday church and they all looked like they had chicken pox or some other dreaded disease. The gnats were the culprit. Some of the parents thought I was a bad scout leader but when I explained what I tried to get the boys to do they completely understood. Amen Rob, There is never a one solution answer to survival. That picture is hilarious. Use a tarp in tick and chigger country and those infected bites will just get worse without anti-biotic cream. The first written description of native americans was “Pock Marked”. And it wasn’t chicken pocks Commie Core students. Oh, you packed a quart of AB cream in your Mystery Ranch Alpha? Good for you. Fester, break open, expand, itch, bleed (bug magnet) run home to the medicine chest, you’ll be all right Woods Warrior. Tarp, Bivy, Tent and Hammock. Spent 20 years in the SW desert then off to tick land. Hammock is off the ground and bug proof if you buy the right one. Easy set up. Think “making do”. Get comfortable, and the bogey man will hone in on your snoring. Carry on Wolverines. Tarps are a great piece of kit. Use them quite a bit, pick the one you want to carry and go a size or two larger. My reason for this is stormy weather, you can fold enough under for a bit of a floor. Larger tarps can extend to a three season ”tent” that way. This is why I prefer the military style poncho, it can easily be used for all the above mentioned functions but you can wear it too. Not only can you turn a tarp into a makeshift shelter, but you can also use it for like a hundred other things. Definitely a great thing to have if you’ve got the space for it. You’ll be crying for mommy when the wind starts blowing, not to mention blowing rain or snow all over you and your gear. The tarp shelters are sure thing when shtf. I enjoy reading k my own. and excited to pack my own. Tarps are underrated for some but I think its quite useful and convenient in any circumstance in survival. Great post here. Way to go!